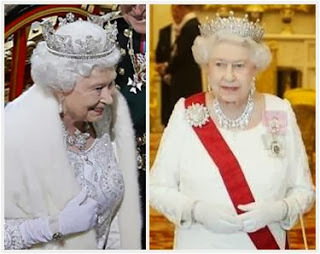 It's time once again to take a look back at the Queen's sparkly year - the brooches, the tiaras, the new stuff, and the favorites. Curious how this compares to last year? Click here for 2012's wrap up. Our very first brooch sighting of 2013 was the Amethyst Bouquet Brooch, and at that time I wondered if it would mark the start of a purple year...and look at that! 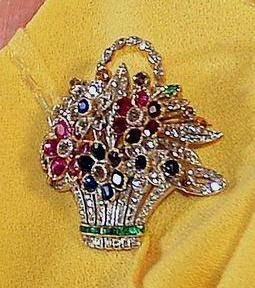 The steady old Frosted Sunflower Brooch received some much-needed competition in 2013. 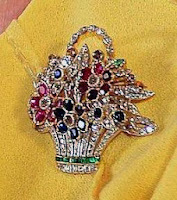 The rest of the brooches on the list are all perpetual favorites also seen on last year's list, with two additional welcomes: the Small Pink and Diamond Brooch which turned into a particular favorite, and the Ruby and Gold Flower Brooch, coming out of nowhere with a small handful of appearances. It may be tied in third place, but the Flower Basket Brooch's appearances during two of this year's most important occasions - Prince George's christening and the always significant Christmas broadcast - gave it special sentimental value over all the rest. It became a designated link between the generations, from George VI (who, along with Queen Elizabeth, gave the brooch to Princess Elizabeth to mark Prince Charles' birth) right down to a future King George. The already enormous brooch collection continued to grow this year. The Emerald and Diamond Sarpech Brooch made its first public appearance at Ascot; new Commonwealth gems were picked up in the form of the New Zealand Blue Pearl Brooch and the Saskatchewan Tourmaline Flower Brooch; a visit to Newhaven added a horse brooch to the family. She was also given a new badge from the SSAFA during a visit in November. The list should probably be longer in the "new to us" category, since there are still brooches that remain unidentified from this year. Woe is us, only one proper tiara appearance, plus the State Opening of Parliament. The Queen usually hosts two state visits a year, but this year the first one only included a state luncheon and no glittering state banquet. And of course, as usual, the annual reception for the Diplomatic Corps was another tiara appearance that went unseen for Her Maj. (It has to be noted that we did get an update of sorts on the Queen's tiara collection when the Duchess of Cambridge was spotted in the Lotus Flower Tiara, whose ownership was previously a question mark.) This year did also see the introduction of a portrait featuring the Queen in the Grand Duchess Vladimir Tiara with emerald drops, though the picture itself was taken three years previously. Has to be the one state banquet we did get, right? It's like she tried her best to give us magpies what we need, throwing in the massive Diamond Cockade Brooch and an extra sparkly diamond necklace. Bless. Happy New Year, and thanks for tuning in this year! A very sparkly 2014 to you all. What was your favorite moment in the Queen's jewel-filled year? P.S. : These tallies include the last brooch appearance of the year...the Queen attended church at Sandringham in lovely purple, wearing the Kent Amethyst Brooch. Click here for a report from the Express, or here for the Daily Mail.